What a wonderful eyecatcher at the beginning of the year! 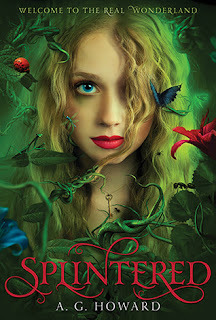 On Wednesday I've found 'Splintered' by A.G. Howard, not only a beautiful cover, with such fresh colours which reminds me on spring, but also an interesting blurb. Well, I hope it will entertain me as good as it looks and sounds, too. Blurb: This stunning debut captures the grotesque madness of a mystical under-land, as well as a girl’s pangs of first love and independence. Alyssa Gardner hears the whispers of bugs and flowers—precisely the affliction that landed her mother in a mental hospital years before. This family curse stretches back to her ancestor Alice Liddell, the real-life inspiration for Lewis Carroll’s Alice’s Adventures in Wonderland. Alyssa might be crazy, but she manages to keep it together. For now. It’s a deft, complex metamorphosis of this children’s fantasy made more enticing by competing romantic interests, a psychedelic setting, and more mad violence than its original."